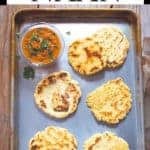 Paleo naan in minutes? Yes! When the recipe is yeast-free, naan in just 30 minutes is totally possible. This bread makes a great accompaniment to thick stews, curries, and other hearty meals. Note: This paleo naan tastes best the day it’s made. All you need to do to mix this dough is combine all the ingredients in a large bowl, stir with a wooden spoon, and wait. And you know that’s the most important part? Waiting. Yup! Waiting. This dough requires a short, five minute rest. For wheat-based baking, the rest would give the strands of gluten time to relax. Since our recipe is gluten-free, we don’t need to allow the gluten to chill. Rather, we want the tapioca starch to absorb the eggs and coconut oil. If you try to knead the freshly mixed dough, it’ll be too soft and tender. During the five minute rest, magic happens. The dough stiffens enough for you to knead it. So don’t skip that five minute rest. To knead this dough, you need one thing: tapioca starch. This dough loves nothing more than to stick to the counter. With enough tapioca starch, this won’t happen. Good question. I have NO idea! “Enough” tapioca starch will depend on how humid the day is and how much starch you kneaded into the dough when you made it. Here’s how to get to “enough”. Generously dust your counter with tapioca starch, about one tablespoon, and then dust the top of the dough with a little starch. Knead the dough gently. If it doesn’t stick to the counter, it’s enough. If it sticks to the counter, gather up the dough, re-roll it, and start over with more starch than you used the first time. I wish I could give you a precise measurement. This is one of those baking things that’s more of an art than a science. Once you’ve kneaded the dough for a minute or so, gather it into a ball and cut into six pieces. Again, dust your counter with tapioca starch. And rub a little starch onto your rolling pin while you’re at it. Roll each piece of dough out, about five inches across. Put the rolled naan onto a baking sheet that’s either lined with a piece of parchment paper or dusted with tapioca starch. Then it’s time to bake the naan. To make the naan, get your griddle nice and hot. It should be almost smoking. Drop a teeny amount of water on the pan to test it. The water should sizzle and evaporate right away. If it does, you’re ready to cook. Place the naan on the hot, oiled pan and cook. It’ll puff as it bakes, which I just LOVE to watch. If you don’t have a cast iron skillet, use the heaviest skillet you own. If all of your skillets are non-stick, you won’t be able to heat the pan as hot. Non-stick pans should only be used with medium heat and never heated above 500 degrees F. This means that naan cooked in a nonstick skillet won’t get those lovely dark spots on the surface. Nor will it have as crisp a crust. This bread tastes best the day it’s made. It tends to dry out overnight. That said, I’ve been known to heat up a leftover piece for breakfast the next morning. I toast it for a few minutes, just long enough to heat it up without further drying it out. Here are the ingredients and tools I used to make this recipe. The following links are affiliate links. 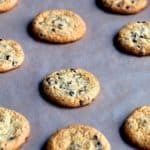 GlutenFreeBaking.com earns a commission when you use them to shop. This recipe comes from the World’s Easiest Paleo Baking. I’d love it if you picked up a copy. 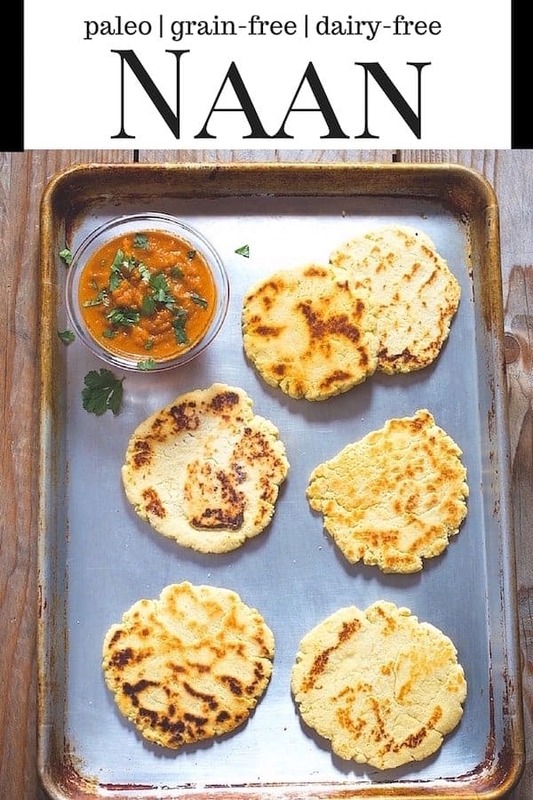 Chewy, flavorful naan is the perfect bread for soaking up sauces and curries. At my house, only crumbs are left by the end of a meal. Be sure to get your flat griddle VERY hot before putting the dough on to it. A hot griddle gives you the classic mottled appearance that makes naan so appealing. *If you don’t own a cast-iron griddle or 10-inch skillet, you can use an 8-inch nonstick frying pan. Naan cooked in a nonstick pan won’t be as dark or puff as much as bread cooked in cast iron, but it’ll still taste great. Whisk the almond flour, 1/2 cup tapioca starch, coconut flour, baking powder, and salt together in a medium mixing bowl. Stir in the melted coconut oil and eggs with a wooden spoon. Cover dough with plastic wrap and allow to rest for 5 minutes. 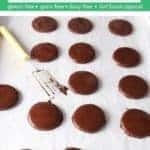 Pat the dough into a circle and cut it into six equal pieces. Lightly dust your counter with tapioca starch. Round each piece of dough and roll into a circle about 5 inches across. Heat a cast-iron griddle or 10-inch cast-iron pan (* see note above) over medium-high heat. Brush the griddle with a little melted coconut oil. When the griddle is very hot but not smoking, place the naan on it. Don’t crowd them. On a large griddle, cook two or three at a time; in a skillet, cook one at a time. Flip the bread when the surface bubbles and puffs, after about 3 minutes. Cook until golden brown on the second side, about 1 minute. Repeat with the remaining dough. 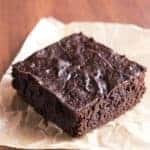 hi – we have a nut allergy – is there another flour we can use? thanks! Sorry! Somehow I missed this. I think the only flour that *might* work is sunflower seed flour. That said, I haven’t tried it. 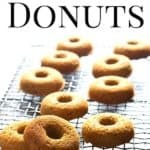 Nut flours, unfortunately, can’t be swapped for non-nut flours in most recipes, especially paleo recipes. I’m curious. Do you like these better than a regular gluten free naan or are you just giving options? Thanks. What am i doing wrong? My dough is very crumbly and not sticking together. When i try to pick up the rolled dough, it falls apart into little pieces. What gives? I’m sure you’re not doing anything wrong. Paleo (grain-free) ingredients vary quite a bit. It sounds like the dough is dry. Try adding a little more water. That should do it! And, just curious, what brands of flour are you using and are you weighing the ingredients or measuring by volume?